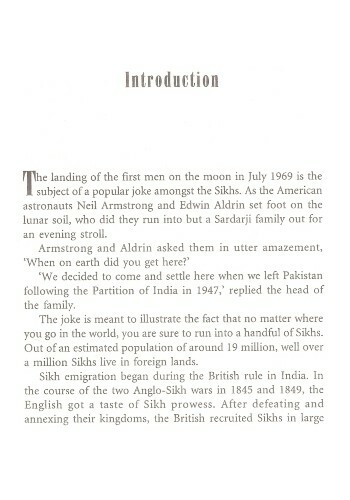 The landing of the first men on the moon in July 1969 is the subject of a popular joke amongst the Sikhs. As the American astronauts Neil Armstrong and Edwin Aldrin set foot on the lunar soil, who did they run into but a Sardarji family out for an evening stroll. 'We decided to come and settle here when we left Pakistan following the Partition of India in 1947,' replied the head of the family. The joke is meant to illustrate the fact that no matter where you go in the world, you are sure to run into a handful of Sikhs. Out of an estimated population of around 19 million, well over a million Sikhs live in foreign lands. 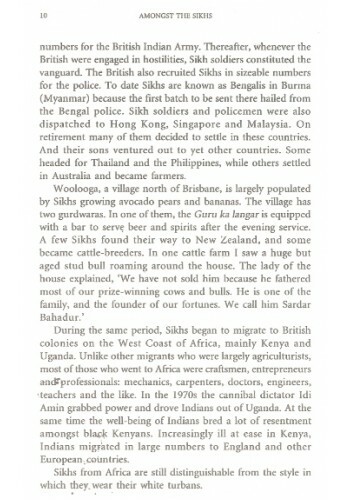 Sikh emigration began during the British rule in India. In the course of the two Anglo-Sikh wars in 1845 and 1849, the English got a taste of Sikh prowess. After defeating and annexing their kingdoms, the British recruited Sikhs in large numbers for the British Indian Army. Thereafter, whenever the British were engaged in hostilities, Sikh soldiers constituted the vanguard. The British also recruited Sikhs in sizeable numbers for the police. To date Sikhs are known as Bengalis in Burma (Myanmar) because the first batch to be sent there hailed from the Bengal police. Sikh soldiers and policemen were also dispatched to Hong Kong, Singapore and Malaysia. On retirement many of them decided to settle in these countries. And their sons ventured out to yet other countries. Some headed for Thailand and the Philippines, while others settled in Australia and became farmers. During the same period, Sikhs began to migrate to British colonies on the West Coast of Africa, mainly Kenya and Uganda. Unlike other migrants who were largely agriculturists, most of those who went to Africa were craftsmen, entrepreneurs and professionals: mechanics, carpenters, doctors, engineers, teachers and the like. In the 1970s the cannibal dictator Idi Amin grabbed power and drove Indians out of Uganda. At the same time the well-being of Indians bred a lot of resentment amongst black Kenyans. Increasingly ill at ease in Kenya, Indians migrated in large numbers to England and other European, countries. Sikhs from Africa are still distinguishable from the style in which they, wear their white turbans. There was yet another wave of Sikh emigration comprising mainly agricultural workers and building contractors from Punjab to the Arab countries of the Middle East and North Africa. Those who could cross immigration barriers managed to get to Europe. An example of their grit is the existence of a small colony of Sikh farmers in villages a short distance from Milan. How many of these Sikh emigres have been able to conform to the Khalsa tradition of unshorn hair and unshaved beards? Have their second and third generations been able to conform to these diktats? 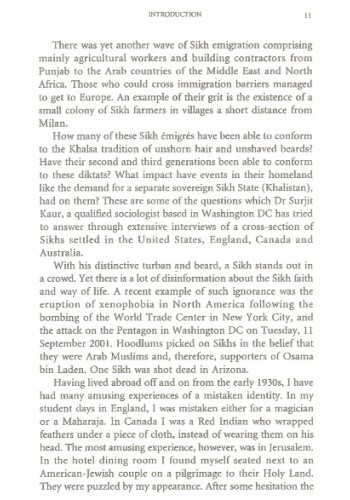 What impact have events in their homeland like the demand for a separate sovereign Sikh State (Khalistan), had on them? 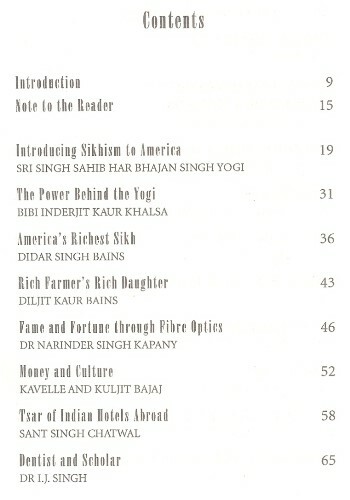 These are some of the questions which Dr Surjit Kaur, a qualified sociologist based in Washington DC has tried to answer through extensive interviews of a cross-section of Sikhs settled in the United States, England, Canada and Australia. With his distinctive turban and beard, a Sikh stands out in a crowd. 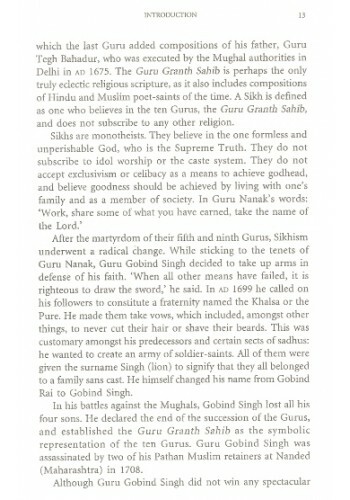 Yet there is a lot of disinformation about the Sikh faith and way of life. A recent example of such ignorance was the eruption of xenophobia in North America following the bombing of the World Trade Center in New York City, and the attack on the Pentagon in Washington DC on Tuesday, 11 September 2001. Hoodlums picked on Sikhs in the belief that they were Arab Muslims and, therefore, supporters of Osama bin Laden. One Sikh was shot dead in Arizona. 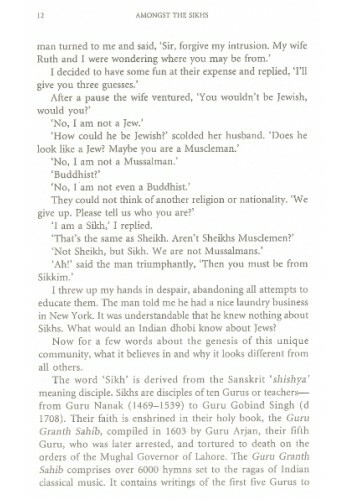 'I am a Sikh,' I replied. I threw up my hands in despair, abandoning all attempts to educate them. The man told me he had a nice laundry business in New York. It was understandable that he knew nothing about Sikhs. What would an Indian dhobi know about Jews? Now for a few words about the genesis of this unique community, what it believes in and why it looks different from all others. The word 'Sikh' is derived from the Sanskrit 'shishya' meaning disciple. Sikhs are disciples often Gurus or teachers— from Guru Nanak (1469-1539) to Guru Gobind Singh (d 1708). Their faith is enshrined in their holy book, the Guru Granth Sahib, compiled in 1603 by Guru Arjan, their fifth Guru, who was later arrested, and tortured to death on the orders of the Mughal Governor of Lahore. The Guru Granth Sahib comprises over 6000 hymns set to the ragas of Indian classical music. It contains writings of the first five Gurus to which the last Guru added compositions of his father, Guru Tegh Bahadur, who was executed by the Mughal authorities in Delhi in ad 1675. The Guru Granth Sahib is perhaps the only truly eclectic religious scripture, as it also includes compositions of Hindu and Muslim poet-saints of the time. A Sikh is defined as one who believes in the ten Gurus, the Guru Granth Sahib, and does not subscribe to any other religion. After the martyrdom of their fifth and ninth Gurus, Sikhism underwent a radical change. While sticking to the tenets of Guru Nanak, Guru Gobind Singh decided to take up arms in defense of his faith. 'When all other means have failed, it is righteous to draw the sword,' he said. In ad 1699 he called on his followers to constitute a fraternity named the Khalsa or the Pure. He made them take vows, which included, amongst other things, to never cut their hair or shave their beards. This was customary amongst his predecessors and certain sects of sadhus: he wanted to create an army of soldier-saints. All of them were given the surname Singh (lion) to signify that they all belonged to a family sans cast. He himself changed his name from Gobind Rai to Gobind Singh. In his battles against the Mughals, Gobind Singh lost all his four sons. He declared the end of the succession of the Gurus, and established the Guru Granth Sahib as the symbolic representation of the ten Gurus. Guru Gobind Singh was assassinated by two of his Pathan Muslim retainers at Nanded (Maharashtra) in 1708. Although Guru Gobind Singh did not win any spectacular victories, he infused his followers with a spirit of daredevilry which helped them oust the Mughals from Punjab, and by the end of the eighteenth century set up a kingdom of their own under Maharaja Ranjit Singh (ad 1780-1839). The kingdom disintegrated soon after his death, and after the two wars in 1845 and 1869, was annexed by the British. Sikhs have two parallel traditions. Their theology remains the same as enshrined in the Guru Granth Sahib and is largely based on the Upanishads. 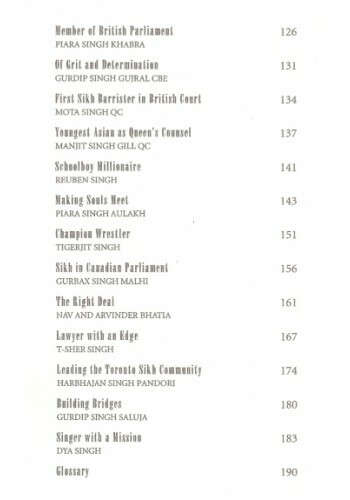 Alongside runs the tradition of the militant Khalsa conceived by Guru Gobind Singh. Some of the never-say-die spirit, which they inherited from the Guru, survives in the form of enterprise and one-upmanship. In a country teeming with beggars, you will never see a Sikh begging for alms. 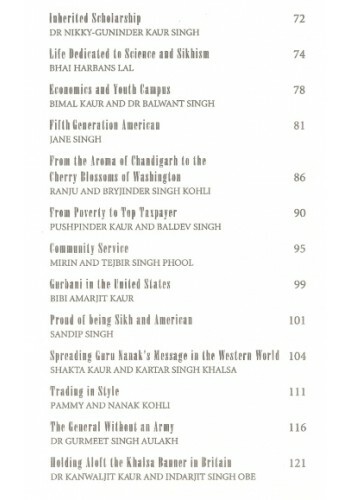 This collection of profiles of Sikhs is entirely the work of Dr Surjit Kaur, carried out under my guidance and with my collaboration. We felt strongly that the story of Sikhs living away from their homeland, striking roots in alien soils and yet retaining their distinct identity, needed to be told. We have done our best to tell it. When some of the Sikhs left their homeland, an uncertain future stared them in the face. The antidote to this incertitude was their determination to make a name for themselves wherever their destiny would propel them. And so they did. Some spread Guru Nanak's message in the Western Hemisphere, while others went on to become Members of Parliament in their adopted countries. 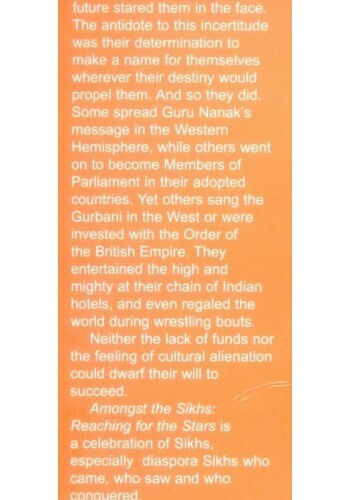 Yet others sang the Gurbani in the West or were invested with the Order of the British Empire. They entertained the high and mighty at their chain of Indian hotels, and even regaled the world during wrestling bouts. Neither the lack of funds nor the feeling of cultural alienation could dwarf their will to succeed. 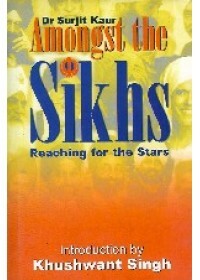 Amongst the Sikhs: Reaching for the Stars is a celebration of Sikhs, especially diaspora Sikhs who came, who saw and who conquered. 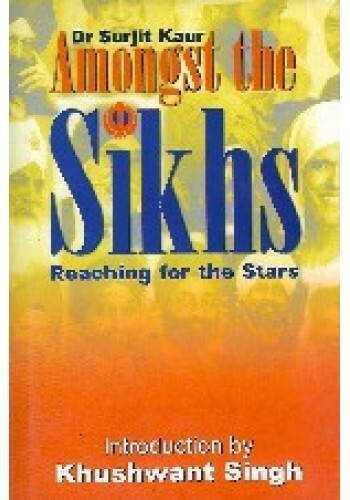 Sikhs came to foreign lands in search of opportunities, and succeeded despite all odds. Jobs were difficult to come by, and neighbours regarded them with suspicion. Some gave up the outward emblems of their faith; others upheld their traditions, striving to overcome the prejudices of an alien people... All of them had to battle heavy odds in the beginning, but always kept up their 'Khalsa Spirit'. Often they were homesick; they missed their families left behind in Punjab, and wept each time a call or a letter apprised them of the death of a loved one. The profiles in this book are of people who carved success for themselves out of alien surroundings. Their profiles may read like fictional pieces but they are real people, no different than you or I.
Dr Surjit Kaur is a profesional counsellor in Virginia in the US.. Educated first in Jalandhar, Punjab, she taught in Punjab for sometime before leaving for the US for higher studies. She received a Master's degree in Education from the University of Idaho, amid a Doctorate in counselling from Washington State University. After a stint with the American Embassy in India, in the United States Agency for International Development, she became a senior research fellow at the Council for Social Development. She worked briefly with the Indian Ministry of Health and Family Planning as a consultant. She is the author of Foundation and Counseling— a revised version of her doctoral thesis, Family Planning in Two Units, and Wastage of Children—a study of infant and child mortality. She has recently been selected to participate in Leadership Fairfax, Class of 2003, in Fairfax, Virginia, USA. 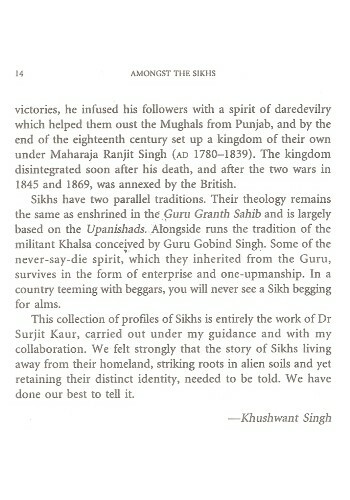 From the Backcover of 'Sikh Shrines in Delhi' By Amrik Singh Though Sikhs are mainly concentr..
Last Rites In Sikhism - Book By Dr. Sukhbir Singh Kapoor , Mohinder Kaur Kapoor ..
Introduction To 'The Heritage Of The Sikhs' By Harbans Singh The word sikh goes back to Sansk..
Introduction To 'The Sikhs' By Dr. Baldev Singh Baddan Guru Nanak was the only Hindu re..
From The Backcover Of 'The Sikhs and The Sikh Wars' By Charles Gough and Arthur D. Innes ..